There’s an old saying we’re all familiar with; you are what you eat. I vaguely remember my mother saying that to me as a child. I suppose it was an attempt to limit my intake of junk food or soda, but really only imprinted in me the desire not to be a brussel sprout. And today it means I’m easy, fast, and cheap. Sorry Ma, it didn’t work. But if you buy the logic that we are made of what we consume, then it follows that we are what we ride. The motorcycle we choose reflects a lot about who we are as riders. The more I reflected on this thought, the more it made sense. 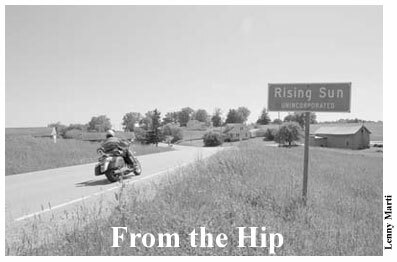 Our choices about size, style, purpose, etc say a lot about our attitude toward motorcycling, and maybe even life. Now I don’t think that the bike, or bikes, you ride is the equivalent to Meyers – Briggs or other personality assessments, but it does offer a glimpse of you as a rider. A look through my garage reveals motorcycle schizophrenia of epic proportions. I have old and new, big and small, on and off-road. Unable to let my interest be corralled in one area of motorcycling, I sample from all the candy in the store. They’re all just so much fun. Add a spouse that likes riding (therapy circles would refer to her as an “Enabler”) and you end up with a collection weirder than sci-fi convention. I’m sure a shrink would try and medicate this out of me with drugs or a nice minivan, with optional 3rd row seating. But I’m too far-gone to be helped now. I just let my eyes and imagination drift from one machine to the next, my fascination never really waning. On the flip side, my diet is diverse and, as I see it, balanced. That was another axiom drilled into me during my youth; eat a balanced diet. You should always eat so many servings of fruit and vegetables, and so many servings of grains and bread. And so I try to get as many regular servings of touring, commuting, sport, dirt, sidecar, and the list goes on. Please pass the bowl of commuting. Oh, and can I get a big scoop of touring, too, with some dirt sprinkled on top? I am full, but there’s always a little room for sidecars. What does your diet consist of? Maybe you’re the Atkins diet of riding, consuming mainly pork, or the vegetarian preferring mainly rice, or the ever popular European diet of pasta and kraut. Or maybe, like me, you like to sample a little of everything on the table. As you can see, I’m all over the map when it comes to motorcycles. My attitude is I can find something to like about almost every motorcycle made. Like a motorcycling Don Juan, I have many loves. A reminder to all riders out there, Wednesday, July 18th is Ride To Work Day. If all the public service ads and the vaguely subtle reminders we dropped weren’t enough, this is an all out call to action. On the 18th, come rain or shine, hell or high water, get out there and ride to work. This is our chance to show the general public that motorcycle commuters are a positive force in the motoring public. I could bore you with a variety of platitudes about social awareness being increased, blah, blah, blah… If you actually are interested in that side of Ride To Work Day visit www.ridetowork.org. For those that just like to ride with out worrying about all the social good crap, just fire up your bike July 18th and point the front wheel toward work.